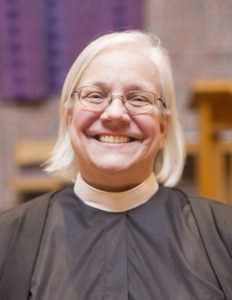 Trinity Lutheran Seminary installed Kathryn Kleinhans as their newest dean on April 10. She’s already looking forward to Trinity’s partnership with Capital. Kleinhans was working at Wartburg College in Waverly, Iowa, as a member of their religion staff before she came to Capital. She wasn’t looking for a job when Capital President Beth Paul reached out to her about the position at Trinity, but she decided that Trinity would be a good place for her. She has knowledge on the operations of both seminaries and universities, so she saw why she would be a good fit. When looking at the merger of Capital and Trinity, Kleinhans sees benefits that aren’t strictly financial. “There are things that we could actually do together to enrich the learning,” she said. She discussed how the merger could give Capital students the opportunity to take some advanced courses in theology. It could also give Trinity students the opportunity to take classes in business or something else they’re interested in. Although Kleinhans was installed April 10, she’s been working at Trinity since January. Her time there has allowed her to figure out what her goals are moving forward. “Trinity’s enrollment has declined, and one of my goals really is to raise enrollment,” she said. “I think that the education we provide here is really good education, and I would like more people to take advantage of it.” It may take a few years, but it’s definitely something she wants to accomplish. The enrollment is something that she’s looking forward to working on right away, but she also has long term plans. “I really am interested in exploring partnerships, not only here in the community, which I think the seminary already had, but also more partnerships with Capital,” she said. Kleinhans wants students to not only take courses at different places around Trinity and Capital, but also be able to enroll in joint programs. There are already a few joint programs. Students can jointly pursue a J.D. at the law school and an M.T.S. at Trinity, but Kleinhans sees that there are more possibilities for joint programs. For example, many students at Trinity are working to become deacons. Deacons carry out their ministry by being involved in aspects of service ministry . They can work in healthcare, as teachers, social workers and other helping professions. Those studying to become deacons would be able to study some of those subjects offered at Capital’s main campus. Kleinhans adds that traditional students at Capital could benefit from being able to pursue something of a religious focus at Trinity. Along with pursuing future goals, there are other reasons why Kleinhans is excited to be at Trinity.